We gave an overview of the Mid-Coast region earlier in our Visit Maine Like A Mainer! series. The full list of articles in the series is available here. In this article we’ll look at more of the wonderful things available to see and do in the Mid-Coast, all within a 60-90 minute drive of Brewster House. Time and space do not permit an in-depth discussion of every one of the beautiful harbors and villages in this region, so we apologize in advance if your favorite was overlooked! 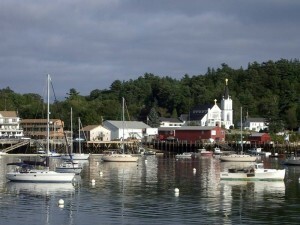 Boothbay Harbor is one of our very favorite locations. Not only is it a beautiful working harbor, but its shops and neighborhoods make for a wonderful place to stroll along, getting a good taste for Maine. 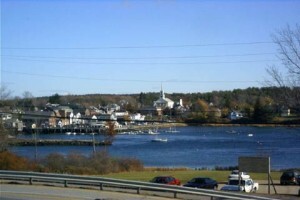 We like Boothbay Harbor so well that we once rented a house here, to spend a week in the area. We could easily walk across the harbor on the footbridge, noting the extreme differences between high and low tides, and enjoy a walk through town, pick up a newspaper, and return in time for breakfast. After a day of sightseeing, it is lovely to come into Boothbay Harbor and get a cone of homemade ice cream at Downeast Ice Cream, right on the wharf. Just a bit farther north, Damariscotta is a picture-perfect postcard setting of a New England town across the river. It has several good choices for lunch, and some nice shops (including a very nice book store) for browsing. Proceeding a bit farther toward the coast, you soon are in the countryside, on your way to Pemaquid Point Lighthouse, established in 1827. The views from the rocky bluff where the lighthouse stands are magnificent. There are great (and entirely different) photo opportunities looking up at the lighthouse from the rocks on either side of it. Returning to US-1 via Route 32 and New Harbor, we soon come to Waldoboro. If you’re in a hurry, taking Route 90 to Camden will save time, but there are several things you’ll miss. We enjoy Thomaston, with its stately old homes and shady, tree-lined streets, as well as driving down the long peninsula to Port Clyde and Marshall Point Lighthouse. Linda Bean’s Perfect Maine Lobster Roll was born in Port Clyde, and Ms. Bean still owns the General Store there. There are ferries to Monhegan Island, and puffin tours and lighthouse tours available from Port Clyde, as well. U.S. Supreme Court Chief Justice John Roberts owns a home nearby. Returning up the peninsula from Port Clyde, the lighthouse at Owls Head provides a breathtaking view of Penobscot Bay. It also has one of the few keepers houses that is still occupied (by a Coast Guard family). Our trip up the coast usually ends with a stop at Camden, where the beautiful harbor can be viewed from the small town park right on US-1, or from Camden Hills State Park. There are also several nice restaurants with views of the harbor for a meal or just a cup of chowder. There’s no question about it, there’s more to Maine!